Help! What should I do with all these carrots?! I bought two five-pound bags of carrots at the health food store because who can pass up a five-pound bag of organic carrots marked down to $0.99? Not me, that’s for sure. We ate what we could before they started going bad and then we chopped up the rest in the Vita-Mix and froze them in 1-cup baggies. And now I have two big bags full of finely chopped (almost pureed) carrots. I figured it wouldn’t be hard to find great recipes to use them in. However, as I started searching online, I realized that maybe finding good recipes using carrots wasn’t going to be as easy as I’d originally thought. So I’m turning to you all–my trusty advisors who rarely steer me wrong–to see what ideas you have for me to help me use these carrots? Anyone have a favorite carrot-laden recipe that is delicious and somewhat healthful? If so, I’d love to have you leave the link in the comments or email it to me. Thanks so very much! I agree with the above. Plus since they are almost pureed, you can sneak them into savory dishes too like meatloaf, meatballs, tacos, sloppy joes, pasta sauces, lasagna, etc. If it is something that doesn’t cook for very long, you might want to cook them a little bit first so that they are soft enough to not be noticed (because even if small, if its still hard, you’ll notice it a little). I use them in meatloaf or meatballs or sauces or muffins. Great deal! Hi! You can find a bread machine recipe for carrot bread at Finding Joy in My Kitchen. It’s a cooking blog. Put them in spagetti sauce! I was going to suggest spaghetti sauce also! you can hide those in so much! meat loaf, spaghetti sauce, etc..
Make carrot cake, or you can put them in a tomato sauce and mac and cheese to add extra nutrients! I was going to say spaghetti sauce and mac & cheese also! I think I saw recipes for those years ago in the cookbook “Deceptively Delicious” by Jessica Seinfeld. My other thought was to use them as a thickener in soups and add them to things that need moisture like meatloaf or even plain hamburgers. I love that cookbook! I would definitely use them in dishes you normally make to add more veggies. I’ve used butternut squash (so similar) in spaghetti/pizza sauces, mac and cheese. Also, you can use it in brownies (sounds weird I know but I use canned pumpkin and they’re delish), breads, cakes and other baked goods. Carrot cake and throwing it into spaghetti sauce is about all I can come up with. We only eat them raw or cooked with a roast at our house. What about some yummy Carrot cake or carrot bread?! Ideas off the top of my head- Throw them in vegetable soup, add to spaghetti sauce, hmm carrots are great but in main dishes they can be tricky. I am excited to see what the readers say also. Carrot cake, carrot soup, carrot souffle, baby food? I have a cookbook that incorporates pureed fruits and veggies into the recipes. I will look and see if there are any for carrots that sound good! My first thought was little carrot cake muffins. Homemade carrot bread, carrot bisque soup, carrot cake cookies and ect. I could keep going! I love carrots! I always use grinded carrots to make marinara sauce, bolognese sauce… any sauce that calls for chopped carrots, especially because being grinded my daughter won’t notice it because its cooked. In my country we mix the grinded carrot with water and sugar for a delicous treat the kids love (like lemonade but with carrots). I read your comment to my son. He would lije the recipe for you ‘carrot lemonade’. Thanks! What country are you from? Michelle Obama was on the cover of BH&G this summer and made this recipe famous. I’ve made it (and canned it) before and it’s yummy. My kids do like it, too. Well, you can always use some of it to stir into tomato soup (carrots add a nice bit of sweetness!) or spaghetti sauce. You can also use them in muffins. If they weren’t almost pureed you could use them in casseroles or other soups, but that might be kind of weird. 😉 I’m eager to see what everybody else comes up with! My first thought was freezing them and using them in muffins or a bread similar to a carrot cake. Kind of like you would with zucchini. My family does not like carrots, so (being the sneaky wife & mother that I am) I always add about a 1/2 cup of finely chopped carrots to many dishes so my family can’t pick them out. 🙂 Usually, they don’t even realize they are there! Try adding some in anything made with ground beef or turkey (meatloaf, meatballs, sloppy joes, pasta sauce, etc) and I also toss some in to my soups – even into my Italian Wedding Soup. Carrot cake anything! and of course smooties! I make a “confetti” meatloaf.. I put a bunch of frozen vegetables in the food processor and chop them up into tiny pieces.. then add to the meatloaf for extra nutrition.. Perhaps you could use your carrots as well as peas, peppers, onions, etc in a meatloaf… Or if you have them frozen in one cup amounts, maybe a couple of meatloafs… I do the same with meatballs.. I hide extra vitamins whereever I can, even though my kids love veggies. Definately add them to smoothies! I make them a lot with oranges, pineapple, carrot, banana & plain yogurt. It tastes almost like orange sherbet . . .
Cook some with your ground beef/turkey/whatever meat with onions and celery, and garlic (and sometimes I use bell peppers) then refreeze for quick spaghetti, tacos, ground beef pot pies, tater tot casserole (recipe on my website), BBQ Beef cups etc. I usually do about 6 pounds of meat or more at a time and then separate it into 8-10 cooked portions. Add them to spaghetti sauce, waffles, muffins, bread, of course veggie soup. I put grated/pureed carrots in my fruit smoothies, I add orange juice, spinach, bananas, carrots, strawberries, and blend, use whatever you have, these smoothies are so good. Carrot cake (although as for healthful, not too sure!) Carrot pancakes — YUM. Esp. with cream cheese drizzle or glaze. Also, put them in your smoothies. I have a yummy recipe for carrot-raisin quickbread in my Better Homes & Gardens cookbook. And I found a recipe on the web for a yummy carrot bundt cake (sadly, I’ll have to look it up again because my bookmarks got eaten by a computer virus). And I bet there are a bunch of sneaky chef-type recipes with a carrot puree in them. Smoothies with carrots and another fruit might be yummy, too. You can cook and puree them then put it in lots of different foods such as spaghetti sauce, lasagna, meatloaf,…extra vegetable kick! There is a recipe for “Healthy Carrot Zucchini Muffins” on the Group Recipes website that is low in sugar and oil (uses applesauce). You can omit the zucc and just use the carrots! Use them in your spaghetti sauce or any tomato based sauce for extra veggies and sweetener (http://glimpseofsonshine.blogspot.com/2010/01/carrots-as-sweetener.html). I’m not sure either of these qualify as healthy, but . . . The waffles are on my to-make list; I have made the cookies and they’re very nice. I bet you could find some muffin recipes too. Carrot cake, carrot muffins, put some carrot in meatloaf or meatballs, put some in veggie soup, mix some into mashed potatoes. What about about the recipes in Jessica Sienfields cook book? I have cut them into little rounds and froze them like that. That way if I do want to throw them into anything, I can get into the large freezer bag, take what I want and put the rest back in the freezer. I also cut them into circles or spears and freeze them that way. I froze two pounds this week for use in stew or as a side dish. These muffins are great for snacks or breakfast. Uses 2 cups of carrots! 4. cook in microwave a few minutes and mix into mashed potatoes (do the same with cauliflower) it’s yummy and my kids like it mixed with butter/s& p and garlic!! I can’t seem to freeze carrots. They always turn brown even with double freezer bagging them. Check out Deceitfully Delicious (cookbook) ~ there are lots of recipes you can put carrot puree into… I put it shredded carrot in meatloaf too! I also add shredded carrots to chili if I have some on hand. I’d go with carrot cake. Put them in salads. Put them in pasta sauce, like others said. Give some away to family and friends. Add them to chili…throw in an avacado too…it makes delicious chili! Maple Carrot Bars – we use this recipe http://www.101cookbooks.com/archives/carrot-oatmeal-cookies-recipe.html and mash them into a cookie sheet then cut into bars. I store them in the fridge (or freezer for long term) and DH takes them to work as a snack instead of storebought granola/cereal bars. There’s a great ginger carrot muffin recipe from cooking light that uses whole wheat flour (you can search for it on their site). My very picky 2 year old loves them! (And the recipe calls for pureed carrots). Cook up with your ground beef/turkey/whatever with some garlic, celery, and (sometimes if I have them bell peppers) then refreeze for super quick spaghetti, tacos, ground beef pot pies, tater tot casserole (on my website), etc. I usually do 6-10 lbs at a time and then refreeze in a big enough portion for a meal. I think you could definitely cut down on the sweetness and cut out the saffron to make it both frugal and more healthful. I would do carrot cake with these. We put them in stir fry all the time. add them to pasta sauce after you saute them in olive oil with onion and garlic. Dice and freeze them for mirepoix! Carrot cake (great looking recipe on thepioneerwoman.com right now), spaghetti sauce. We also always put shredded carrots in our broccoli cheese soup when we make it. Just saute with the onions. Trying to think of things not already mentioned …. You can use them in fried rice. There are many other recipes out there. I use cooked brown rice and it tastes great! If you make a large batch of fried rice, you can freeze it into dinner sized or individual portions! Has nobody said Carrot Jello… Not healthy but oh so yummy! you use Lemon and orange jello and pineapple. I grew up on it… super yummy. And my mom always put way more carrots than most recipes call for. the jello just held it together. Lemon and orange jello and pineapple and carrots? could i get a more precise recipe? I have a toddler and that would be a healthy snack AND sneak in some veggies 🙂 Thanks! Prepare jello according to box directions except use the pineapple juice for a portion of the cold water. set in the fridge to gel. When it is half way gelled add the pineapple and carrots. Do not do this before it has at least partially gelled because the pineapple will make it to where it won’t gel at all! So, this is what my mom said over the phone. she usually does not measure.. just use the amount of carrots that looks right to you! I hope this helps. It’s not an exact science. If it is a holiday or special occasion she usually will peel the carrots before she grates them. It look better this way but you don’t get the vitamins what you would with the peel on. I always put shredded carrots in my lasagna, but that idea seems to be well covered already. The other dish that came to mind that my family loves is Shepherd’s Pie. Carrots, in any form, are always a great part of this traditional comfort food. I would make it an excuse for corned beef in the crock pot with lots of potatoes and carrots! Or a beef stew with large slices of carrots and potatoes! Make a lot and freeze for the nasty winter day! make homemade tomato sauce, you can sneak veg into the kids and they won’t even know. I puree up all kinds of veg into my sauce, then freeze it in quart bags and you have organic, homemade sauce whenever you want. I put finely diced carrots (along with celery, mushrooms, and peppers) in my meatloaf. Works particularly well if you use turkey/chicken/extra lean beef, as it adds quite a nice bit of moisture without adding extra fat. While you’re at it, make your meatloaf in the large sized (Texas sized?) muffin pans and everyone gets the yummy crunchy bits and a nice moist middle! I never make them any other way anymore! I would use it in soups or in baked oatmeal with pumpkin pie spices. Then top it with a bit of whipped cream or milk. Enjoy all the possibilities. I have a yummy zucchini bread recipe that has carrots in it. I will see if I can find it. I use carrots in my zucchini bread, I usually cut the zucchini by 1/2 cup and add the carrots to replace. I’ve also made chocolate veggie bread using my zucchini bread recipe, I replace 1/2 cup of flour with cocoa powder and then use zucchini, yellow squash and carrots in equal parts to total the full amount of zucchini. My son LOVED it but won’t eat squash any other way. 🙂 Being sneaky in a good way is good! Carrot ginger soup – freezes well too and also makes a great dressing!!! carrot tacos. Mix two cups of ground/processed carrots with green chilis and chopped sweet onions. Put two spoonfuls into a corn tortilla and deep fry as you would a regular taco. top with lettuce, tomato, cheese and salsa. You can also add pinto beans to the mix of carrot, green chili and onion for more texture. Oh my gosh this happened to me last year!!!!! Steer Clear of carrot cake and other baked goods if you are using basic recipes. Especially if they are as pureed as you say they are. I had the same thing happen to me with some older carrots from the farmers market. It didn’t turn out as I hoped, there was a lot more moisture in the cake. However, I would throw them in your pasta sauces, casseroles, etc. That’s the best thing you can do with them. If you want to bake, you will need to carefully review your recipes and modify. Good luck. It took me awhile to get rid of mine! Perhaps you could steam/mash them a little and substitute them for some of the pumpkin in your famous pumpkin choc chip muffins? Since they’re so much sweeter than pumpkin, you might not want to go whole-hog, but I’m sure they’d be a really yummy and nutritious partial substitute! I always put shredded carrots in my meatloaf. It’s a way to add extra vitamins in a little bit of a sneaky way. Curried Carrot Soup, again supa easy, leaving you with 2lbs less carrots. carrot and pineapple muffins, carrot cake, lots of soups call for carrots and stews. after cooking some more with broth, onions, garlic… add some grated ginger. Then, puree the heck out of the it. make as soupy as you like. Yummy with bread. I LOVE everything on this blog and as you can see, lots of carrot recipes! All healthy, also. A very traditional soup base (originating in France I think) is to saute a mixture of carrots, celery and onions, then puree the mixture. It makes a really delicious soup base. I think your carrots would work great as a soup base. Another idea, give some to friends with babies to use as organic carrot baby food. We’ve mixed it in with taco meat to much success..and ditto much of what has already been suggested. I would use them in macaroni & cheese (store bought or homemade). I usually use squash puree, but carrots would give it more of a “real” mac n cheese color if you are using whole wheat pasta. My nephew is constantly asking for “real” mac n cheese when I give him whole wheat macaroni and cheese. The brown pasta makes the cheese color not so bright. You can also puree it a little more and replace the oil in your baking recipes. I would only replace up to 50% of the oil, because of the strong carrot flavor. You can make some healthy brownies by substituting half of the butter for carrot puree. You can add puree to meatloaf, or make some carrot spice cookies. Or, add it to your oatmeal (without pureeing it some more). My mom makes “carrot cake oatmeal” by adding spices and grated carrot to it. That is a GREAT deal on the carrots, good job! I used cooked mashed carrots in any recipe that I would use pumpkin. I just use canned fire roasted tomatoes rather than roast them myself. Let us know what you end up using them for! I learned how to used all kind of pureed vegetables in food from the cookbook by Jessica Seinfeld called Deceptively Delicious. Highly recommend it. I put chopped carrots in almost everything! They take on the flavor of what they are cooked with, so even though only one of the six of us loves them, we will all eat them without noticing they are there. Some examples are your brown bag burritos, lasagna, spaghetti sauce, chili . . . really, the possibilities are endless! 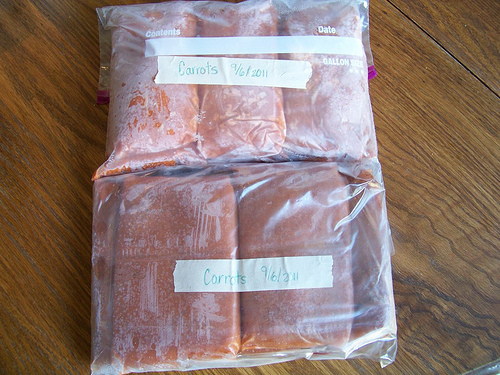 I grate up carrots and put them into gallon freezer bags. I just take my rolling pin and hit the frozen carrots to get off the amount on want when making carrot cake. I add shredded carrot to lots of things; any ground beef recipe, chili, pasta sauce, soup, stew, sloppy joes etc. It’s a great filler to stretch meat and add nutrients. You could also make a carrot soup. Use it in meatballs etc.. Deceptively Delicious cookbook by Jessica Seinfeld has lots of options for vegetable purees. i don’t have any recipes off hand, but carrot cake, muffins, bread! throw some in spaghetti sauce, meatloaf, meatballs, they’re easily hidden and they add a nice sweetness to most things. enjoy! You can never go wrong with soups or smoothies! Personally, i would have eaten those yummy gems in about a week–by myself! I love raw carrots! BTW- I only use 2 tbsp butter, not 3/4 cup. I concur, put them in anything tomato w/ a tomato base and they will be a great addition, without the taste, mmmm healthy! When I make mashed potatoes, I throw in some carrots to make them look “cheesy.” You can’t taste them if you only put in about 1 carrot’s worth, but you do get the extra vitamin A. Add them to omlettes or meatloaf or meatballs. I like adding them to ground turkey or chicken burgers to keep it moist. Add in some other shredded veggies, beans, onions and breadcrumbs to make homemade veggie burgers. squashes) to every day food usually when my family isn’t looking. That is an amazing deal on carrots Crystal! Carrots are great in about anything! I have a chicken rice soup variation that includes carrots. Saute veggies of choice (onion, celery, and carrot are what I use) in a little oil. When tender, add 2 1/2 or 3 cups chicken broth and some thyme and sage. When the broth boils, add 1 cup rice. Cook until rice is tender (20 minutes for white; 35-ish for brown). Stir in shredded chicken, and salt and pepper to taste. Love this in cold weather! I put them in ground chicken patties with celery to make chicken burgers, then put a little hot sauce on the bottom of the skillet and turn them a few times. Put them on a bun and add sharp cheddar or blue cheese and it’s like hot wings. I like pureed carrots in applesauce. Too bad they’re chopped. If they were sliced, you could saute them in a touch of oil, add a few tablespoons of orange juice and about a tablespoon of lemon juice, and season with salt, pepper, and freshly ground nutmeg. Once the juice becomes a glaze, top with toasted, slivered almonds. Surprisingly good, and I don’t usually care for cooked carrots. It is my husband’s favorite. I usually double the sauce and freeze half. I saw a recipe a while back for carrot cake freezer jam. Sounds good to me. Carrot soup is actually pretty awesome, a little cumin and curry, chicken broth and cream. Lots of recipes out there with different variations. We like it best at “room temp” or even a little chilled. Carrot and Pumpkin Soup – delish and several different ways to make it. Perfect for fall. I agree with several other comments, that you should sneak them into other recipes. We do this all the time: Tacos, your haystacks, spaghetti, meatloaf, any soups… The possibilities are endless! Get the cookbook Deceptively Delicious by Jessica Seinfeld..It has TONS of recipes using carrot puree. Saute onion & celery. Add carrots, potatoes, broth & parsley. Cook until potatoes are tender. Puree with hand blender. Stir in cream and season with s/p. This is about the same recipe I use. With fall coming I sometimes use 1/2 carrots and 1/2 pumpkin (or butternut squash). Oh my goodness what a great deal!! I don’t blame you one bit for stocking up on those. I would have been tempted to buy 5 bags, though!! Looks like you got some great ideas for using them up….and they covered all my ideas. 🙂 Enjoy!! My girls and I LOVE this!! and if you don’t care about it being raw or non dairy- you could make the topping with cream cheese. I was going to suggest the “hiding” thing too. Just added nutrition to a dish that has a stronger taste to mask it! 🙂 Try adding it to brownies instead of the oil or applesauce…I wonder if that’d be good!! Carrot Orzo! Basically shredded carrots simmered with onion and pasta, then mix in shredded parmesan cheese at the end. I had an excess carrot problem a few years back. I had processed them fine but found that there was a slight grainy texture becuase I had not cooked them long enough and because of the large quantity I had used in my first recipe lol… So I opted for vegi-lasagne 2nd time and stuffing for pork, cabbage eggrolls third time ( which worked out perfect).. In my case, the freezing had added excess water, so plan a little extra time to cook off the water-that comes along with it. I am always having cooking science class at home. Have fun! We made this last week and loved it(kids even wanted to take it for lunch). Since you purée it at the end I don’t see why you can’t use your carrots. Instead of goldfish, I made grilled cheeses using my waffle maker;) Kids loved it! After cooking ground beef or turkey and draining fat add 1/2 cup pureed carrots and taco seasoning with a dash of water, simmer and stir until excess moisture is cooked out, makes great HEALTHY taco meat and no one ever knows! I add pureed carrots into anything red, orange or yellow to get my kids and husband to eat them! They go in spaghetti sauce, pizza sauce, macaroni & cheese, etc. I also stir some into chicken broth when I make soup, because they won’t eat the pieces of carrots, so this way they get a little! You could add some to smoothies (they’re so sweet), and obviously use them like canned pumpkin in muffin and cake recipes. What about Split Pea soup? Fall and winter are approaching and that soup would be good to have on hand in the freezer. If interested, I have a great recipe for it. Or Carrot Raisin Salad. Just a thought or two for you!! Good luck. Can’t wait to hear what you decide. There is a copycat recipe for Carrot Souffle like they serve at Picadilly cafeteria. Not something you would want to eat everyday due to the sugar, but I know you use other sweeteners so it might be more healthy for you. It is delicious! Awesome to serve with Fall meals and at Thanksgiving. I make a Turkey meatloaf where I use 2 lbs of ground turkey and chop up carrots, green and red peppers to add in it! whenever we harvest a huge batch of carrots. one things i make is carrot croquettes. I promise, you be swept be thrilled at how easy it is to put togather. They freeze really well. you can also serve these in pita or in wraps , make a sandwich or just eat them with ketchup. Herez the recipe link. ( i make mine without the sauce condiment). Another way to use carrots is in making Tsimmies…a wonderful winter veggie Jewish dish. Email me if you want the recipe for this. Carrot dill soup- our families favorite until our youngest daughter developed a carrot allergy! I’ve made a chocolate carrot cake before which was pretty good and a little change from the typical carrot cake. I put them in the pumpkin muffin recipe you posted last year or the year before and add white chocolate chips and also I have an awesome recipe for egg rolls that uses them! Also for Crystal, I was going to mention that King Arthur Flour had a carrot sandwich bread recipe in the last couple of years that was wonderful–not finding the recipe online, but it used pureed carrots in it–we loved it! These are my favorite too. In fact, last time I made them, I juiced the carrots and then used the pulp in the muffins and it worked great! I use sucanat/WW flour/coconut oil and eat way too many! after the fact – but you could have just blanched them and froze them that way. I do that all the time with all kinds of veggies, mostly from my own garden. I’m sure you can use the carrots in all kinds of different soups. chicken noodle soup, potato soup, broccoli cheese soup, maybe even chili, add some to sloppy joes to make them a touch healthy (haha), lasagna sauce, veggie lasagna….. I agree with the majority. I will chop up carrots and add them into almost anything. Like when I have to saute an onion or green pepper I will add finely chopped carrot right in with them. My kids are oblivious and I love getting extra veggies into their food. My absolute favorite carrot recipe….and the kids love it too! Cook, puree, freeze and add to anything with tomatoes for a healthy boost! I freeze them whole to use to make chicken stock. You can also chop, par boil, freeze for later — just like a bag of frozen carrots at the store. Shred and freeze for carrot cake/muffins, etc later. This is going to sound funny, but my mom used to put carrots or zucchini in our banana bread. Carrots are sweet enough that you don’t really notice them but it adds extra nutrients and banana bread recipes without one of them are weird to me now. I think this looks really good! Add a cup of carrots to your favorite pancake recipe and some pumpkin pie spice. You almost don’t need the maple syrup! It’s so good my son and I make them for lunch! Yum. I add finely chopped/grated carrots (along with grated garlic) to hamburger when I make hamburgers. It really helps to stretch the meat! Fabulous recipes mentioned here. I’ll have to try some. Is there anyway you could package some homemade baby food (ice cube style) and donate to a dear new mom. Might bless the socks off her. How about carrot cake muffins? Delicious and healthy. Plus, since you already pureed the carrots it will make them extra soft and moist. I made it before with baby food carrots I had extra of. I just added some carrots to applesauce I made today for my kids. You can’t taste the carrots and the sauce looks fine even though it is a bit more brighter-colored than usual. Shredded carrots are great in cole slaw, tossed on salad, mixed with tuna salad, or baked into things. 99 cents for 5 lbs is a great deal! Let us know what you come up with to use them up. Can you add them to smoothies? Carrot cake is a definite must! Don’t forget the carrot and raisin salad too! You could also make carrot and raisin muffins. Throw some in a green salad, or pasta salad… use some when you layer your lasagna.. make it a veggie lasagna.. or you could put it in the meat or sauce too!! Put them in smoothies along with fruit. No one will ever know the difference if you don’t tell them. Trust me, I did it when I made my grown daughter a smoothie and she never guessed! I’ve been making a soup for the last year that my husband loves. It’s very simple and only has a few ingredients. I dice carrots, potatoes, and onions and bring them to a boil. Cook until just slightly firm. Pour off excess water. In a large soup kettle, add 1 can of chicken broth, garlic powder, salt, and pepper. Add cooked veggies. Cook 1 lb of ground beef or turkey and add to soup. Add 4-5 cups milk, more if you like a more “soupy” soup. Milk and chicken broth sound like a horrible mixture, but it really is good! I make a similar soup, but stop short of the meat and milk – jusdt a carrot-potato consomme. Carrot Bread! I’ve make it using carrots instead of zucchini (same recipe, different veggies) still super good! I’ve done the same thing. Sometimes half zucchini and half carrots. Yummy, easy, and healthy snack when made as muffins with at least half whole wheat flour, “healthier” sugar, etc. I’ve done the same with blueberries, carrots and zucchini! Alton Brown does glazed carrots, I make them all the time, they are AMAZING! Lentils! I cook a bag of washed lentils (about 2 cups) with as many finely chopped surplus carrots, wilting celery sticks and sprouting onions/garlic as I have in the fridge, add chicken stock, salt and a can of diced tomatoes, and cook 30 minutes for soup, 40 if I want more of a saucy lentils consistency. It’s delicious either as a main or side dish. I’ll second that. Add some elbow (or other small) pasta toward the end and top each serving with Parmesan cheese. Yummmm. One of our favorite taco recipes calls for ground chicken, grated carrots, onions, and 2 cups of chopped tomatoes. Add cumin, chili powder or whatever seasoning you like. These are both pretty and tasty! My husband didn’t even realize they had carrots in them (even though visually its pretty obvious)! When I make quiche, I replace half the milk with pureed carrots. Yummy! We always add them to meat loaf, but you could add them to meatballs too. Really, you could add them to anything: pasta sauce, sweet breads, pancakes, soups, baked pastas, risotto… you get the idea. yep I was gonna say meatloaf! Makes it soooo moist!!! This recipe was part of an ad for Agave Nectar. Preheat ove to 350 F. Prepare 3 – 12 cup muffin pans with liners. In a large bowl, combine agave, eggs, and oil, beat well. Stir in carrots. In a separate bowl, combine dry ingredients. Blend in batter. Fill cups only half-way for proper baking. Bake 22 to 25 minutes until the center of a muffin springs back when lightly touched. I’m trying this one….sounds delicious!! Whole Wheat Carrot & Raisin Muffins: https://docs.google.com/View?id=ddm8vxt9_18f37khzd5 – adjust spices to your family’s taste. Me too! It makes the sauce a little sweeter, so adjust your spices accordingly. YES! And add it to your sauce before making lasagna! My very observant husband never knows it’s there! I was going to suggest this as well. I always chopped or puree carrots into my homemade pasta sauce. No one ever complains. Yes! I use FishMama’s recipe (Lifeasmom dot com) for crockpot red sauce, and when I’ve found organic carrots marked down, I’ll shred them and add them when I dump everything else in the crockpot. We use that sauce primarily for our weekly pizza night, so I puree it after it’s cooked & cooled. So yummy. Carrot Soup! Very healthy and perfect for the fall. Carrot and Cilantro soup is one of my favorites as well as carrot and ginger. golden meatball casserole…it calls for grated or sliced carrots. The recipe should pop up if you type the name into google. You can make “Gajar Halwa” indian desert. Just Google for recepie. Even if you don’t try it this time – DO try it in the future (SO GOOD!!). I’ve substituted Splenda for all the sugar and it was still good. I was going to suggest the carrot souffle, but someone beat me to it. It is SO GOOD!!! I would probably add to green smoothies, soups, pasta sauce. You could add them into chicken pot pie/beef and potato pot pie, add to orange chicken. I second the suggestions for carrot cake/muffins! I don’t know if it has been mentioned but I have made a pie from carrots before! Tasted a lot like sweet potato. Very orange though, lol. I’ve always wanted to try the recipe below, which calls for equal parts carrots and flour (1.5 cups each!). It would help you use up carrots in a hurry! Toss them in anything that they’ll “hide” in–spaghetti sauce is one thing I can think of that doesn’t seem to ever change much with added veggies. You could make an “a la vodka” sauce for pasta. I don’t have a recipe on hand, but my mom uses carrots as part of the sauce base. Hope that idea helps. Here’s an AWESOME carrot cake recipe that bakes amazingly with fresh-ground whole wheat flour! It freezes awesome too (w/o frosting, of course). I frost with a cream cheese/honey frosting…just those two ingredients! Yum! Will you update us when you decide? Carrots are perfect in spaghetti/tomato/pizza sauce. Sweet, thick, and healthy. Also great in risotto and layered in lasagna. Carrot Halwa… an Indian carrot dessert. Another idea…when I do a turkey, either a breast or whole turkey, I make a bed of carrots, celery and onions and lay the turkey on top to roast. (Put a tad of oil on the bottom too, so it won’t stick). Add at least a cup or 2 of water to the pan before baking. I promise you when you strain off the veggies, for gravy, it will make the best gravy you ever had!! Just make gravy in your usual fashion as you do from broth. The French have a word for this… mirepoix (chopped carrots, onions and celery). It is the base for many dishes – soups, stews and under roasting poultry. I always roast whole chickens on a bed of mirepoix and toss a couple cloves of garlic and herbs inside the cavity. Then I use the bones, garlic, herbs and roasted mirepoix to make stock. Oh, man! Use a cast iron skillet to roast and the veges caramelize, adding even more flavor to everything. And I also love to use cast iron whenever possible. A friend let me have one of their HUGE oval shaped cast iron baking pans…I have no idea what it might be called, but it mostly fills up the oven in size and I use that when I can, instead of the usual turkey roasting pan. Also referred to as the trinity…carrot, celery and onions…..base for alot of Italian meals! I never heard of vinegar in stock. Huh. I’ll have to look into it. I do the same thing making big pots of stock and freezing it. And Elizabeth… don’t wait for Thanksgiving and turkey. Try chicken. So delicious! 😉 I never buy boneless, skinless breasts. They are so tasteless. I always roast whole birds and use the meat the same way I would breasts – chicken chili, enchiladas, etc. Dee, as I have many food allergies, actually ORGANIC chicken is about 75% of the meat I eat. One recipe I tried once…and need to relocate again, involved stuffing the inside of a whole chicken with lemons, garlic and herbs, etc….and it tasted so delicious…actually better than the rotisserie ones from the store!! I actually prefer the dark meat on poultry, but often do use just breasts because of my husband’s preference. (I am allergic to turkey, but eat it some anyway. I have also found that any organic meat not only tastes better, but seems to go down easier, even if allergic to it). We do have turkey some outside the holidays as others in our kin can eat it easier than chicken. But it has been awhile since I have seen a Glatt brand turkey, which I have found in our area anyway, is the best (plus Trader Joe’s have them some and they are the best price too). We put at least a cup of pureed carrots into our spaghetti sauce. Oh, and its good in chili, too. Extra veggies you never really taste! You can sub carroots into any recipe that calls for pumpkin. I have done this and can’t realy tell the difference. I really like it in the pumpkin chocolate chip muffins that was posted on your site! Tomato soup- 2 or 3 can of tomatoes, sauted onions carrots and celery (about a cup or two of each) in olive oil with basil, garlic, salt, pepper. Purée everything and add broth, about 4-6 cups. I love Fishmama’s chicken noodle soup and I always put the carrot in my food chopper so it is fine and the kids (and hubby) don’t mind. I am adding one, though it’s probably not the most healthy, but I thought it would be a sweet treat for your family instead of dessert and it’s super quick. I usually can my carrots, I have never tried freezing. I pull out one quart of carrots at a time and drain them, and throw them in a pan. Add butter (probably a couple tablespoons) and brown sugar (a couple tablespoons) and a little flour if the carrots are very wet. Cook until tender and it makes an amazing sauce! My kids eat them all and so does my sweet Husband, afterall, this is exactly how his Grandmother makes them! 🙂 Enjoy! someone may have already said this but carrot salad sandwhiches…i’ve taken the pulp from juicing carrots before add mayo and spice and use as a sandwhich. yum! I had a carrot salad sandwhich (with finely grated carrots) on a European flight one time and it was fantastic. I hadn’t thought of it for a long time. Might try it again!!!! What a great idea! I’ve always just thrown the carrot juice pulp into the composter. Thanks for a way to repurpose that into a delicious entree! oh and the carrots in the sauce is good for helping with the acid from the tomatoes..
Do you have a doggie? Carrots are great for dogs. You could put some in with their food (about 1 tablespoon per day) as long as nothing has been added to them. It is great for doggies that have digestive issues. Also, last season, we were able to keep carrots for several months in the refridgerator by putting them in bag inside the cereal box. There is something with the bag that helps keep them fresh. Jessica Seinfield’s cookbook, Deceptively Delicious has tons of great ways to use pureed carrots hidden in foods. Yes, I was thinking the same thing! I can’t remember the exact recipes, but there were some good ones. The Deceptively Delicious cookbook by Jessica Seinfeld uses them a lot. We LOVE the Spaghetti Pie out of there. They make a wonderful addition to chicken soup. Other ideas: carrot cake or muffins, meat-loaf, spaghetti sauce, and lasagna. They cook down quite a bit in meat sauces so you could probably add a good 1-2 cups per recipe. Wow! There’s been a lot of awesome ideas! I’m excited to try some of these too! You can add them to spaghetti sauce, vegetable soup, etc to sneak in a few extra veggies! I hide lots of veggies in my family’s meals – Spaghetti Sauce, Meatloaf, Sloppy Joes and Chilis – any tomato based meal will hide them well! Add to any of the following…..Casseroles, soups, sweet breads, cake, brownies, taco meat, spaghetti sauce. This carrot cake recipe from is really yummy. And it will use up 2 cups of grated carrots…not bad! If you have a juicer, run them through the juicer and then juice some apples. Apple carrot juice is really good. And then take the left over carrot pulp and substitute it for zuchinni in zuchinni bread, or add it to muffins or cake. You can also use the pulp in meatballs, meatloaf, stuffing, or added to a sauce that is tomato based. I haven’t experimented with the apple pulp yet, because I don’t peel or seed my apples before juicing them. I was going to suggest carrot juice. It is supposed to be a miracle juice. My husband will agree with that notion; he used it to repair his immune system ten years ago. Thank you! I read this far to see if I could freeze them as I found a really big bag on sale cheap and didn’t want to waste them. If you have a recipe you like for sweet potato casserole, carrots work just as well. Everything can be the same, except you might want a bit more sweetness to balance out the carroty flavor. Meatloaf, meatballs, lasagne, egg rolls, tacos, chilli, stuffing, and veggie and potato soups are a few of the things that I have stashed ground carrots in. I add finely shredded carrots to meatballs and banana nut bread – and the beauty is the kids can’t really taste them and there is a splash of color! Obviously carrot bread and carrot cake are at the top of my list, but I also put them in almost every “red sauce” dish. Lasagna, spaghetti, you won’t even notice them. Stick it in with your chili. It’s another way to stretch out the batch. I roast carrots along with my garden tomatoes, onions, zucchini, eggplant & puree it to make a fabulous roasted tomato pasta sauce. This is the only way I make sauce now & I make enough to last until next summer. The carrots add a sweetness to the sauce the is hard to pass up. Since you have already pureed them, I would toss them in a skillet with other pureed veg & saute them until cooked before I add them to pasta sauce. IF you need further instructions on how to do that, email me. Healthy Morning Muffins from Everyday Food. My 5 year old loves these, and they freeze really well. Soup, casseroles, add it in when you cook ground beef – just add them to stuff! Next time, you can do what I like to do with our carrots from the garden to store for year round use. I make sure the green parts are off, wrap them 10-12 to a bundle in newspaper, then lay them in a container, and then layer a bit of sand to cover. Store in cool, dry place (like your pantry in the basement) They keep for several months for us this way, and then you can use them “fresh” for longer, or for broths! I always puree excess then add to my spagetti sauce, taco sauce, etc…that way I don’t waste and I have extra veggies added in. My kids beg for it! You should definately try it out! How about carrot cake? Baby food? Carrot Roll? I make a pumpkin roll from the Libby’s brand recipe, just substitute the carrot with the pumpkin. Carrot soup? That’s all I can think of. Good Luck!! I would use them in spaghetti sauce, soup, meatloaf and cakes/muffins! Good luck. There is a Rachel Ray recipe on foodnetwork.com that is called buffalo chicken chili. It is amazing and the carrots would work perfect. I always use more than the recipe calls for. Anything (homemade) tomato based I add carrots to. Adding them seems to help with acidity of the tomatoes and also sweetens some sauces so that you don’t need to add the pinch of sugar recommended. Also add to your green smoothies. I love afghan rice – especially with kebabs or greek burgers. You just add a bit of honey, a handful or raisins and grated or finely chopped carrots to rice (its wonderful with jasmine rice) in the last 10 minutes of cooking. Also, pureed carrots with a good bit of butter is really tasty as a side and couldn’t be more simple. Sprinkle cinnamon on top if that’s your thing. You could add it (cooked and pureed) to pancake batter or muffins or it might work well as a replacement for the applesauce in your fantastic whole wheat waffles. Ragu sauce is a hearty meat pasta sauce. Saute finely chopped onions, carrots, and celery until soft, add chopped meat, brown and then add canned tomatoes. Simmer all day with salt pepper and oregano. Add basil and parsley 10 minutes before you turn off heat. VERY EASY in the crock pot. Carrot Juice uses up a lot of carrots easily. My mom would always buy 5 pound bags, and it would make just enough juice for all 4 of us. It’s really good for you, but not always the best tasting 🙂 Just send them through the juicer. You could add apples to make them sweeter. I’ve been meaning to try this myself – I saw on somebody’s blog that they always add grated carrots to their ground beef. It stretches the meat and adds flavor as well. I grate carrots often and put them in our meatballs/meatloaf–almost anything ground beef! Carrot and ginger taste great together. My dad makes a great carrot ginger soup. There are lots of recipes for various versions online, try a few and see what works for your family. If your family likes coconut, I think I’ve seen more Asian-flared ones with coconut too. I also like carrots mashed with other root vegetables, blended with turnips, or parsnips even just carrots and potatoes. Plain and simple is nice with a little salt and butter or coconut oil. The addition of a single “exotic” spice like coriander or nutmeg can make carrots quite exciting, a blend like curry can really kick it up. And really, your carrot-apple muffin with coconut from your Simply Centsible Breakfasts is a great recipe. (I’ve even made it with a lot less oil for my family with no problems.) OK, now I have to go get some early apples…. In a mixing bowl, combine oil and sugar. Add eggs; mix well. Combine flour, baking soda, salt and cinnamon; gradually add to the creamed mixture alternately with bananas. Stir in carrots and pecans. Transfer to a greased 9×5 loaf pan. Bake at 350 for 55-65 minutes or until a toothpick inserted near center comes out clean. Cool for 10 minutes before removing from pan to a wire rack to cool completely. We always put carrot puree into our pancake and waffle mix and make as normal (sometimes add a little cinnamon or nutmeg). We like them better than plain! Another idea is carrot bars with cream cheese frosting (think pumpkin bars, more like cake). And I’m sure you can use some of it in your yummy smoothies! Thank you for the suggestion. I tried the carrot pancakes. They were good! My first impulse was carrot cake, too. (Maybe it was all those years as a kid helping my mom in the kitchen every year by grating 3 cups of carrots for my dad’s birthday carrot cake.) I just have to reiterate the beauty of adding grated carrot to salads. Back in my college days, I used to work in the kitchen for a summer camp for inner city kids, and veggies always came back untouched. We also put a basic salad out (family style dining) probably every meal, with sliced carrots in it (admittedly some of the other staff’s definition of carrot slices was VERY thick), and we’d always have all the carrot chunks come back even if the rest of the salad was eaten. Then I had the idea of throwing the carrot into the food processor, and the kids LOVED it! They ate more salad, since some colorful carrot sprinkled on top adds to the presentation. The best things was it was actually quicker than chopping carrots, since I could do big batches in the food processor. Also, carrot juice is the best–add a little apple for sweetness. It tastes good and makes you feel so healthy! Add them to marinara sauce along with other veggies like spinach! put them through a juicer or make cream of carrot soup base – i do this all the time – make cream of carrot soup right up to the point where you add the creamy dairy ingredient – cool it and freeze it , then when you reheat, just add your dairy product – also, cook them down and use them as you would pumpkin or sweet potato – if you get them to the right consistency, they are all pretty interchangable in recipes like pie or muffins or quick bread – hth! Carrot cake is always a good candidate, but you can sneak them into almost anything. Meatloaf, pasta sauce, meatballs and the list is endless. We love Veggie Manicotti around here! You mix carrots, zuchinni or summer squash, ricotta cheese, mozerella cheese, green or yelllow onion, and an egg. Put in some kind of shell and top with spaghetti sauce and more mozerella. I have TONS of squash and zucchini in my freezer right now I need to use! Sorry if this has already been suggested…Morning Glory Muffins. They are a bit labor intensive but totally worth it. Carrot cake, carrot muffins w/dates or golden raisins. tomato sauce, my all time favorite is add to soups i.e. minestrone or stirfried… of course for the latter it would have been nicer to have them sliced or chopped and flash frozen for easy access and texture, but it still can work. esp. with Chap chae noodles, rice or cooked w/ ground turkey soy sauce and wrapped in spring rolls like lumpia. serve w/ sweet chili sauce. Muffins with raisins. I also add to stuffing and any rice dish. Several times I have added them to banana bread to make it healthier. Jessica Seinfeld’s second cookbook, Double Delicious!, is full of restaurant immitations with a twist. She adds pureed vegetables into almost anything from meatloaf to quick breads to cookies (?). When I was a busy mom of a 6-12 month old, it would have been such a blessing for someone to bring me a gallon ziploc half full of ice cube tray frozen carrot puree blocks! Here’s my recipe for Apple Carrot Bread – super yummy! I just have to say, I love you and your website! God put you in my life for a reason. Thank you! Grind all the ingredients in a mixer (like vitamix or magic bullet), except for the oil and salt/pepper. Once everything is fairly ground, add the oil and salt/pepper and mix up real quick. Stays in your fridge for weeks; even months. I use it to spice up my dishes at the table. Enjoy! And thank you for all you do! This sounds wonderful! I’ve never heard of it but the ingredients are right up our alley! Throw in meatloaf, meatballs, smoothies, pumpkin Bread /muffins, spinach rice pilaf (rice made with chicken broth…. Throw in some carrots & broken spaghetti noodles, add chopped spinach last 5 minutes). It’s too late this time around, but next time make up a batch of pickled carrots! (I like mine sweet, hubby likes the sweet & sour…plenty of recipes on google.) I am always on the hunt for cheap bags of carrots just for this purpose. But you want the carrots whole, not shredded/diced. I also like to grate carrots into my spaghetti sauce, meatloafs, and just about anything else I can think of. I often put shredded carrots in spaghetti sauce and meatloaf to get the kids to eat extra veggies. So many good ideas listed! And with winter coming, I’ll be adding some to soups. Just saw a link on Parents.com with a video of The Sneaky Chef. She sneaks all kinds of veggies and fruit into meals so her kids get enough of them. She has two cookbooks I believe (although I don’t own them), but I know you can see some of her recipes online. She uses a lot of purees to replace other ingredients in recipes, including carrot and sweet potato puree, caulifower and zucchini puree, etc. Just an idea. You can put these in just about anything. You might want to make up a bunch of soups and freeze in gallon freezer bags. You could make Chicken Noodle (add the noodles when heated up), Minestrone soup, Stew. Also, we put carrots, peas & corn in our chicken spaghetti. If you haven’t already froze them, you could stick them on the dehydrator if you have one. Then, add to recipes at your leisure. I know there is a Cream of Carrot recipe out there. Oh, there are several recipes for muffins that call for them. There is a Powerhouse Muffin recipe and I have a recipe for Peanut Butter muffins (you put pureed bananas and carrots in these)…and they are yummy. We cannot a bunch of quarts in the Spring. I got 50lbs. of organic carrot buy ordering in bulk from my local grocery store. They made just a little profit. So, we ate and ate on them for meals, and canned about 20 quarts. There are great recipes for carrot cashew quiche on allrecipes.com. I had it this weekend for the first time at a baby shower and it is really delicious. Neither my husband or I like carrots but we realize the importance of eating healthy. Since we don’t like the taste, we usually hide them in stuff. We also hide it in ground meat. It’s a good an healthy filler and makes the meat go a long way. Use it in tacos, spaghetti, or anything else! Finely chopped carrots or shreds tossed in a bit of oil and vinegar is great as a grown up side. We had this many times in Germany with sliced beets and cabbage all tossed with oil and vinegar. We came to really enjoy it. I make these carrot cake pancakes for brinner (breakfast for dinner). Very yummy! wow! you sure got a lot of responses. I didn’t read them all so this may just be more of what others have said, but in addition to carrot cake, try disguising them in other foods. Add them to spaghetti sauce, meatloaf, taco meat, meatballs, etc. I had tons of zucchini from the garden & this is what I did with some of it and I am sure it will work for carrots too. In fact, you have inspired me. I planted carrots in the garden this year & they are a little bitter for eating out right, but I think I will chop & freeze them & do exactly as I just suggested you do. thanks! I’m not sure if anyone mentioned it yet, but Jessica Seinfeld’s cookbooks are a really great source for using any veggie purees you might have. I used this cookbook when I was trying to use up the rest of my daughter’s baby food stock pile once she started eating finger foods. You could give them to someone who needs baby food 🙂 And put them in pasta sauce, but I see that’s been mentioned already! In a large bowl, beat together eggs, oil, white sugar and 2 teaspoons vanilla. Mix in flour, baking soda, baking powder, salt and cinnamon. Stir in carrots. Fold in walnuts. Pour into prepared pan. What CAN’T you add pureed carrots to? Soups, stews, chili, enchilada sauce, risotto, meat balls or meat loaf, salad dressings, pancakes, bread, muffins, etc. Just use it in place of some of the liquid in any recipe. I like to make cous cous with part water and part broth or carrot juice. If they are pureed you might be able to do the same type of thing (might need to water down slightly or add more water to get water/cous cous ratio correct). It turns the cous cous orange which kids think is super fun. Add peas to make a fun green and orange contrast. If you make it at Halloween time add peas after plated and make Jack o’Lantern faces and stem around a round scoop on everyone’s plate. Enjoy! I make homemade cheese sauce for mac and cheese. I make a white sauce put in some pureed cooked carrots and also add some pulverized white beans. I then keep adding the sharpest cheddar cheese I can find until it starts tasting cheesy. I then freeze in silicone muffin tins so it’ll be as fast to prepare as the box version. Morning glory muffins – also carrot bread with coconut, pineapple, rasins and nuts! I add shredded carrots to taco soup. Or to taco meat. Or shredded beef in the crock pot. Zucchini and Carrot Soup!!! :] Delicious! Have you ever had a carrot pie? It is very similar to pumpkin pie, with a very subtle difference – I’ve only had it once, but it is ever so yummy! I didn’t have time to read the previous comments, so I’m sorry if I’m repeating. I add carrots to tomato based sauces, like spaghetti sauce, pizza sauce, soup. I almost puree them and then add them in. They do little to the flavor, but add a lot of extra nutrition. You could put them in almost anything you want extra veggies in. Throw some in meatloaf, spaghetti/marinara sauce. You could also try to put a small amount in homemade mac and cheese (I would do a small portion first as I don’t know how much it would affect the flavor). I do this all the time with squash/zucchini that I get from my in-laws or the marked down bin at the grocery store. I also do it with spinach. Of course, carrot cake or carrot cake muffins would be YUMMY! Fresh shredded carrots can be used in hamburger soup. The main ingriedient is hamburger and carrots, and since it has to simmer quite awhile, the carrots add a awesome flavor to the broth. It can be frozen in plastic bowls and reheated for later. With cold weather on it’s way, hamburger soup is a great meal and filler-up in the winter. Try Carrot Kugel. It’s delicious. I got this recipe from http://www.elanaspantry.com. Blend everything together until smooth. Place in 8″ glass pan and bake at 350 for 1 hour. It’s good hot or cold. This cake tastes better after one day in the fridge. for a more solid cake. 2. Mix oil, sugar, and eggs, beating after each addition. 3. Add dry ingredients, carrots, pineapple, and nuts and mix well. 5. Bake a 325º for 35 to 45 mins or until it is done in the middle. Cake will be brown. Beat well until smooth and kind of fluffy. Spread on cake (thickly) when cake is cool. Serve cold, cut in squares. Carrott cake or muffins!!! Throw in some chocolate chips….yum!!!! 3/4 cup of yogurt or sour cream, etc. **IF YOU DON’T USE sweetened yogurt, INCREASE your sugar(sucanat if have) by 1/4 cup, or add another banana and a little more sugar, etc. or 2 cups of sweet potato or pumpkin. Basically, I try to have a batter than won’t be liquidy but is also not like stiff cookie dough. So, soft batter that can be piled high on a spoon without falling off, but with some airiness to it. Also, bananas, yogurt and salt seem to be very helpful ingredients in getting the right texture and sweetness. Convection 335 for at least 17 minutes or regular bake 350 for closer to 20 (in my oven — yours may be faster/slower). These are super healthy and kids love them! What about pot roast or boiled dinner? Paula Deen has great recipe for split pea soup called Shaggy Man Split Pea Soup, I add about twice the carrots the recipe calls for and it’s yummy! Carrot and coriander soup, the husband loves it!! We never have that problem, what with having horses and even our dogs love them. In fact the medium size dog has never stolen thawing meat from the countertop, only carrots! This may sound overly simple, but my dad used to make mashed carrots as a side dish. My uncle used to mash carrots into mashed potatoes. I have put mashed carrots with rice. Deceptively Delicious: Simple Secrets to Get Your Kids Eating Good Food by Jessica Seinfeld has a really good brownie recipe in it that has pureed carrots and pureed spinach in them. There are also several other recipes that have carrots in them. Carrots are great to add to any juice if you have a juicer. My husband does an apple, carrot, pineapple, cucumber, ginger root blend in the juicer that is amazing! Don’t know if anyone has mentioned this but Jessica Seinfeld’s book “Deceptively Delicious” has several recipes with carrot puree hidden in them! I make carrot cake pancakes for my kids they love them and its a good way to sneak some veggies into breakfast. I just add some finely shredded carrots and some cinnamon into pancake batter. (they also freeze really well) In Jessica Seinfield’s first cookbook ‘deceptively delicious’ she has a recipe for ketchup that uses carrots. Check out soulemama dot com (am I allowed to do that?) and she has an awesomw Carrot-Tomato Soup, since it’s September, you might also have an abundance of tomatoes…. Here’s a really easy soup recipe. Combine in pot, bring to a boil, simmer until veggies are tender. This is a really flexible recipe – you can add other veggies as well. I like to make my kids meatloaf cupcakes. I make meatloaf then put them in a muffin tin (put the meatloaf in baking cups just like you would a cupcake). After the meatloaf is cooked I put mashed potatoes on top to look like frosting on the cupcake. Then I put shredded carrots on top of the mashed potatoes to look like sprinkles on the cupcake. My kids love this!!! My friend always adds them to her spaghetti sauce. Some extra beta carotene and no flavor difference. You’ve gotten lots of delicious advice, but I would suggest putting them into pizza crusts, biscuits, rolls, or breadsticks. I often make my pizza crusts w/ pureed chickpeas, shredded carrots, zuccini, and/or baby spinach. This really amps of the “passive” nutrition. Add them to muffins or pancakes. I have a most amazing carrot soufle recipe. It tastes like a dessert and looks like it was difficult to make, but it isn’t. I got it from Southern Living. Put is back in the vitamix or a blender and make carrot, apple, ginger juice! Put it in Spaghetti Sauce. I would break off a chunk and put it in spaghetti sauce whenever I made spaghetti…other than that you could use a chunk in fruit smoothies too! Cook them, mash them and then use them in place of pumpkin in baking. They make great pumpkin ….er I mean carrot pie. It is the spice that makes it taste so good. You can also use them in soups. Add 1/4 cup pureed carrots to your smoothies (enough for two smoothies) when mixing in the blender. You can’t tell they’re in there and you get your veggies! I had once read a tip to get more veggies into kids–put pureed carrots (or any kind of baby food veggies) into spaghetti sauce. It won’t change the taste or the color, but certainly adds more nutrients! Souns like a great idea & you’ll probably never know they are their. Could use for a carrot cake or maybe just in any cake mix, mabe even in cole slaw. I also do this with spaghetti sauce and chili. Just use the equivalent of 3-4 carrots and toss it in. I feel better giving it to my toddler. I put carrots in everything. I routinely buy 10 lb bags of carrots and I keep a 3rd whole, slice another 1/3 to make cooked carrots with cinnamon and honey (I freeze them raw in bags), and the other 1/3 I chop into carrot slices for snacking. You can throw the finely chopped carrots into soups (chicken, lentil, beef, veggie), I also saute onion, chopped carrots, bell pepper, eggplant, and tomato and throw it in with some pasta. Add a little store bought pesto and you have a tasty veggie pasta. Other than those ideas, you can do carrot bread/muffins (like a zucchini bread) or carrot cake. Carrot cookies, carrot raisin bread, carrot soup, carrot raisin slaw, carrot orange juice, put carrots/v-8 juice, carrots in meatloaf, put carrots in meatballs, carrots in stirfry! Puree them and put them in a vegtable soup stock. This is a link to a Carrot-Ginger Soup. I got the original one from a Cooking Light magazine but this is very similar. It’s great hot or cold which is a bonus! ALSO…I just remembered the “If you give a Mom a Muffin poem”…you could make up muffins, include the poem and share w/some Moms? Add to jarred spaghetti sauce for extra veggies and sweetness. This may sound wacky, but steam, puree, and then mix it with peanut butter to stretch and health-ify (yep, just created a verb that should never have been created) your peanut butter. Looks wierd, tastes the same. My husband’s trick. I’d be preparing some in boiling water, Steamed I guess you call it till tender then drain the water add butter & salt and eat up! Also make a few carrot cakes.You could make a few and freeze what you can’t eat right away for a healthy dessert or snacky type food.Don’t forget to add cream cheese icing,to die for!!! And a dear friend of mine who passed away last January used to make a carrot salad.It was good but pretty sweet. In france we eat pureed vegetables pretty regularly…you can steam them and purree them just like you would for mashed potatoes add a drizzle of cream or butter and some salt and pepper… you can also take the steamed vegetable (carrots, broccoli, fennel, whatever…) and add it in with mashed potatoes which gives for a more hearty texture, changes up the flavors and makes the mashed potatoes a little less caloric and more nutritional…plus my kids LOVE getting their vegetables this way….but my kids like vegetables in general… the other option is to do pretty much the same thing but thin it down with broth or milk to make a creamy soup…you can add in other vegetables (and less potatoes) if you go this route. just wanted to add…if you “mix” your vegetables this way you need either a hand-held soup blender or a food processor…it won’t work good doing it with beaters like a lot of americans do for mixing up mashed potatoes. Do you have a juicer? Put your carrots into the juicer along with other veggies and fruits such as celery, beets (adds a robust flavor) cut-up apples, etc. Makes a healthy, delicious drink full of vitamins and minerals. If you’ve never had this before, you’ll be surprised how sweet the carrot juice tastes. You can use it in applesauce cake or muffins. Use one half carrot puree and one half applesauce. Add some honey or sugar for sweetness. Could you make some baby food with it and give to a friend who is in that stage at the moment? I add carrots,broccoli, cauliflower, garlic, onions, etc to the ricotta cheese, or creamcheese/cottage cheese part in a veggie lasagna for added veggies and a thicker heavier lasagna to fill you up faster. I use them in meatloaf, cake and muffin recipes (instead of applesauce), I also make a carrot soup (instead of butternut squash) I cook in Chicken broth with onion, potatoes, celery, and parsley, puree add a little fat free half and half at the end. I serve with home made corn muffins. I also add them to my spaghetti sauce to increase the veggie consumption. That’s a lot of carrots!! You might be able to add some to smoothies? My kids don’t like it, but carrot soup is an option. You can whip up some carrot cake or muffins, Emerald has a recipe for So Good Morning Muffins that call for carrots but don’t seem too carrot-y. Also, you can throw some in spaghetti sauce or lasanga. For lasanga, we saute 2 small zucchinis and cook up 2-3 carrots, then we add these to half a pound of ground turkey and mix in a jar of spahghetti sauce. Good luck! you could mix some up in your spaghetti sauce for added vitamins. Use them for cakes,casseroles,soup,salads,muffins,and cupcakes. When I make tacos using ground turkey instead of beef I stir in 1/2 to 1 cup of pureed carrots. It adds moisture and sweetness to the mix. It’s the same color as the taco seasoning so my daughter has no idea it’s in there. Also works for turkey meatloaf or meatballs. 2. I sneak carrots into a lot of foods. Everytime I make chili, spaghetti, smoothies, and a few other things that I can’t remember off the top of my head my husband is actually eating carrots. I do this by blending them to smithereens in my blender. It is so easy to hide them in anything with tomato sauce. They just blend right in. Oh and I remembered another one… enchiladas! Steam. puree, then add to apple sauce. Dehydrate the combo and make apple/carrot leathers. You could just steam, dehydrate and grind into a powder to add to baked goods, snack bars, and sauces. The beauty of dehydrated foods is the storage space they save. Only tiny quantities of vitamins are lost in this particular combo. WOW! 385 comments already! I’m not reading a single one. Just wanted to say that next time you have that many extra carrots, if you’ve ever tried making sweet pickles, you can pickle the carrots! We made pickled pumpkin one year, and had so much leftover brine (mostly vinegar, sugar, water and spices), we decided to pickle some extra carrots we had. They turned out great! You just have to peel and cut the carrots into pieces about the size of a small gherkin pickle, and boil them to your preferred al dente level of crunchiness, then follow typical canning procedures. The kids really liked them, too. Best wishes! I had a recipe that I used to make a lot for carrot bread (a lot like pumpkin bread) from my Better Homes and Garden cookbook. I’ve also tried recipes before for banana carrot bread. try using them in smoothies, carrots are sweet and will add flavor. try fruit, & veggies, oj and if you can find them try using chia seeds the highest consumable omega 3 food out there, they are smaller than a sesame seed and taste less. I make smoothies with banana, what ever fruit i have in the fridge, carrots, celery etc. just try it its a good breakfast loaded with vitamines. My first thought was carrot cake or the ole stand by of glazed carrots. I also put carrots in my chicken noodle soup, veggie soup, and ham & bean soup. You can also add them to any tomatoe sauce for a natural sweetness. Golden Mashed Potatoes! Mix as much pureed carrot as you’d like into your mashed potatoes. You can’t taste the difference and kids think they are extra special. I am always sneaking veggies in wherever I can…shhh! Don’t tell 🙂 I’ve added carrots (celery or broccoli) into meatloaf, spaghetti sauce, sloppy joes & tacos. I make sure they’re finely chopped and added only to dishes with stronger flavors. In addition to getting another serving of veggies into my kids without a fight, it also helps to stretch our food dollar! Turkey burgers! It makes the turkey very moist and delicious!! I always use lots of carrots in the pasta sauce I make for the freezer. I have also used carrots, onions and green peppers in my sloppy joes. If your family likes carrots, you can often get away with substituting up to 1/2 of the requested amount for sweet potato or squash recipes. So if you’re making mashed sweet potatoes (YUMMERS), go with 2 c sweet potatoes & 1 c. carrots. They blend well, so you don’t have to add as much sugar for this as you might for sweet potato casserole/ pie. You can also slip some in butternut squash soup, but keep the ratio a little lower (3 c butternut: 1 c carrot). Happy carrot-ing! Fresh herbs, sour cream, plain yogurt etc. all make great garnishes. I never make this soup the same way twice since I usually try to use ingredients we already have in our cupboards/fridge/patio garden – my husband has loved each and every one.